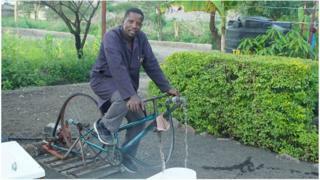 Bernard Kiwia can make almost anything from a bicycle. He first became known for inventing a mobile phone charger operated by, yes, a bicycle. Bernard started work as a bicycle mechanic until he realised that he could make many more things from the spare bicycle parts. He started inventing, and hasn't stopped. "I create technologies because I realise it's something that can help my family and the community," Bernard says. But it's not just bicycles. The windmill operated washing machine he has invented saves his family time and effort as it washes their clothes when the wind picks up overnight. Bernard's inventing has now stretched from his own house and garden across his community. About 800 local innovators have used Twende, the inventors' workshop he started. He's been called "the father of rural innovation" in Tanzania. "What we want to show people is they have skills to make their own technology that they can afford, they can repair, they can find the spare parts that they need," Bernard says. "With local people, their income is always small and the kind of machines you can buy in the shop are not made for these local people because they're expensive. That's why I'm focusing on local." One of those local innovators is Frank Mollel who invented the "Fert-Cart", an adapted wheelbarrow, which helps to cut down the time it takes to spread manure and fertiliser on fields by hand. Frank's business model includes Fert-Carts that can be rented out to farmers who don't have enough land and profits to be able to afford to purchase his invention. Twende makes sure all those in their workshops learn good business practices and come up with a business plan. One of Frank's clients says that using the machine has enabled him to afford his children's school fees. "Fert-Cart cuts down the billion of hours that are lost in agriculture activities," Frank says. "Africa, especially Tanzania, needs the novel technology that can help farmers to increase their crop productivity and income among the smallholder farmers." Jesse Oljange's avocado oil press is already changing the lives of his community. "Twende is a social innovation itself," Jesse says. "You have people doing different projects in the same room. So if you have a problem you can reach out to anyone on the table and you will find the solution." Before the oil press, the avocados would rot where they fell because the farmers could not get a high enough price at the market. Now women in the local community are using it to extract the oil which they sell in the market. Jesse says that being involved with Twende has also enabled him to apply for funding using the workshop as an umbrella organisation. Funding and access to capital are two of the main challenges for local innovators like Jesse. Most of all, having a mentor like Bernard helps. "If you have a problem you can't get your head around, tell Bernard, he just thinks about it for two minutes and will tell you - go this way. So, we have a lot of mentoring too," says Jesse. Magreth Omary's life has been changed by the machine she created at Twende for cutting soap. It's allowed her to start her own soap business and also to share her machine with women in her town who are widows, giving them an income as well. "I'm thankful that my children are no longer kicked out of school because of unpaid tuition fees." she says. It's an example of how a simple invention can change many lives. "My dream for the future is to see Tanzanians with our own products, tools that can help ourselves with our daily activities." says Bernard. To make that happen he invites school children from the local area to Twende to get them involved. The workshop also has a small van it uses to go out to remote villages with tools and training. "In Twende we do creativity that will help the community. So we see the challenge that affects the community and try to overcome it and solve that problem," says student Lightness Simon Kinisa. As well as lessons in practical skills like welding, the Twende school programme also includes workshops on how to run a small business and draw up a budget. "Bernard Kiwia is very special." says Issa Kanguni from the Tanzanian Inventors and Techno-Thinkers Consortium. "It's very difficult to be an innovator in Africa or Tanzania because those who have ideas to innovate they don't have the means." By sharing the resources at Twende, Bernard Kiwia hopes to inspire his local community to keep innovating no matter what and to provide solutions for themselves and the world beyond it. "Sometimes you fail, so you do it again," he says. "But by the end you come up with something good."